One of the most compelling niches that has developed in the E-Bike market is the E-Chopper. This Cruzer makes the same statement as a Harley or an Indian but it does let you be sensitive to the environment and your wallet at the same time. It costs less than ¼ of the price of a Harley, less than 1% of the operating cost, and has zero carbon emissions. 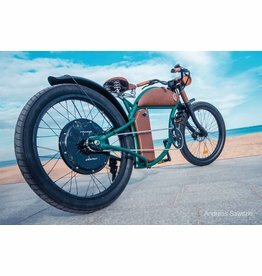 European-built bike designed by French entrepreneur Mathieu Rauzier for Rayvolt, a Spanish company.